The life of French diplomat and engineering mastermind Ferdinand de Lesseps, driving force behind one of the world’s most celebrated canals. Historian Karabell (A Visionary Nation, 2001, etc.) gives Lesseps (1805–94) his due and more in this homage. Karabell characterizes his widely traveled subject as “more a citizen of 19th-century Europe than he was of any one country,” though the great canal that he cut through the silt of the Sinai was of course made for the benefit of France and fulfilled one of Napoleon’s grand dreams. Karabell takes the Suez, completed in 1869, as one of the world’s grand constructions and more, a work with psychodramatic implications: “Lesseps himself would never have devoted himself so single-mindedly to implementing the project had he not suffered loss. . . . Disgrace and the death of his wife propelled him. His pain became the source of his inspiration, and his ambition, a way to heal himself.” That may well be, but the tens of thousands of Africans press-ganged by corvée into making Lesseps’s dream a reality were surely troubled by other pains. Granted, Karabell does a reasonably good job of describing the role of forced labor in the work of European empire-building in Africa. He shows, too, the effects of the Suez Canal on regional politics once it was built, extending the story into the 20th century, though giving only cursory treatment of events such as the Suez Crisis of 1956. His treatment of Lesseps himself tends toward the florid, while too often the surrounding narrative plods along datum by datum, point by point. 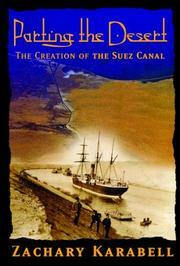 The account suffers overall by comparison with David McCullough’s far better work on canal-building, The Path Between the Seas (1977), which considers Lesseps’s later efforts to build a canal across the Isthmus of Panama. A middling effort, but likely of some interest to students of European imperial history and contemporary geopolitics.